Our wedding ceremony and reception was held at an outdoor venue in a park. 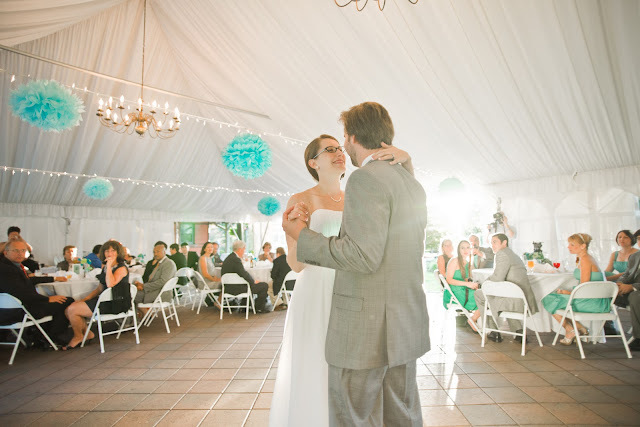 The reception was held in a white tent with white lights strung across and hanging chandeliers. I saw so much inspiration for tent decor in my online research that I wanted to include some hanging decorations as well. I found a tissue paper pom-pom kit by Martha Stewart at Michaels in our color scheme and I knew I had to have it. A few weeks later the kit was drastically marked down in price and so I didn't hesitate to grab a bunch. As you know, I used a similar, smaller version of this technique for the centerpieces so they fit in perfectly with the rest of the decor. The kit includes everything you need to make 7 hanging pom-poms of varying sizes and shades of aqua. They were fairly large and due to space issues and not wanting them to crumple before the big day, I ended up making these two days before our wedding and giving them to our caterer to bring with them. Our good friend and wife of one of the Best Men hung them from the tent alternating sizes and colors. They added a beautiful and festive element and continued our theme into the reception. It was well worth the time spent at the last minute because it helped us create the perfect party atmosphere. There are some fabulous do-it-yourself kits out there that take some of the pressure off finding the right materials for executing a project. Don't be afraid to try them as they are a happy medium between DIY and hiring someone to create something for you. Wedding photo by Vic Pellicier @ Pellicier a.p.d.